Jan Stigmer has for many years received high acclaim from audiences and critics alike for his personal and communicative style of playing. It is without any doubt the lyrical and colourful quality of his playing that set him apart. Born in Sweden in 1964, he received his first violin lessons at the age of six. His main teacher was the late professor Tibor Fülep and he contributes most of his education to him. He also studied with André Gertler and Herman Krebbers. 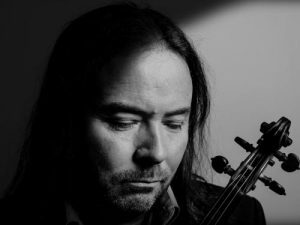 Since his early twenties he has toured extensively and he has performed with some of the world top orchestras such as the English Chamber Orchestra and the Moscow Chamber Orchestra and many others. His travels have taken him to most European countries as well as several trips to North America, South America and Asia. After his North America début in Chicago with Sibelius violin concerto, the critic of the Chicago Tribune called it “…a breath taking tour-de-force”. And his first performance at the famous “Sala Cecilia Meireles” in Rio de Janeiro was voted performance of the year in “Globo”. “The American Record Guide” recommends his recording of the Haydn violin concertos to its readers worldwide and “The Gramophone” described him as “a player who clearly knows what string players like…very communicative, full blooded playing”. Having toured extensively in China he became the first western musician ever to perform in Tibet in 2005. As a chamber musician, Jan Stigmer has worked with artists like Imogen Cooper, John Lenehan, Josef Suk, Victor Liberman, Norbert Brainin, James Galway, Michala Petri, Barry Tuckwell, Barbara Hendriks, Barbara Bonney and many others. After a three year long absence from the concert platform, Jan Stigmer marks his return with his rendering of the 24 Caprices by Niccoló Paganini. Jan Stigmer plays on a violin by Antonio Stradivarius. "A violinist with strong opinions who clearly knows what string- players like.. very communicative, full blooded playing."